The only one of its kind in Brisbane. Our golf shop is home to the GCQuad Golf Simulator Experience – the only one of its kind in Brisbane. This golf simulator has been designed to help you understand your golf swings and overall techniques. From here you’ll have better insights into improving your game so you can achieve consistent ball strikes and optimise your hitting distances. As well as being fun, it calculates the correct hitting distances and even shows which brand and model of golf balls matches your strength and ability. Our golf simulator allows you to play 9 or 18 holes on some of the best golf courses in the world, including Pebble Beach – all in beautiful 4K resolution. While enjoying your game, our simulator collects information to determine your individual golfing characteristics. Spin of the golf club and ball. Our golf simulator in Brisbane is available to book for individual lessons seven days a week. It’s also available for private functions and is hugely popular for men’s birthdays, mateship comps, and other celebrations. For all enquiries and bookings, call us on 07 3870 3433. What is the golf simulator used for? Whether it be a warm up, indoor swing session to escape the heat, or just a change of pace from your usual game, you can hire the golf simulator for your own exclusive use. The possibilities are endless when you engage one of our PGA coaches for a 1 hour golf simulator lesson. They have the knowledge and expertise to review your game, and provide some pivotal tips and tactics. It’s your 60 minutes. You may elect how the time is spent if you have particular shots to focus on, or otherwise let our coach drive the lesson. 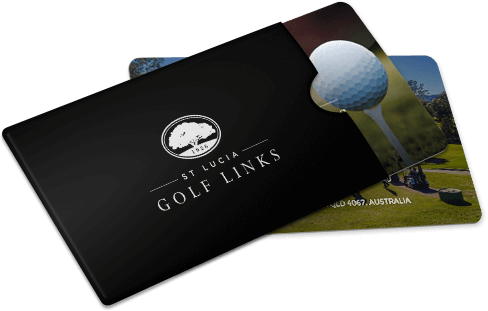 You may even decide to finish up with a Nearest to the Pin competition on Pebble Beach, a golf shop favourite at St Lucia Golf Links. ARE YOUR CLUBS THE RIGHT FIT? There is no technology more accurate than the Foresight Golf simulator to fit your clubs and putter. Fitted golf clubs will improve your performance in many ways, open you to new innovations and styles, and ensure good posture and balance for a smooth swing. Elect to have just 1 club fitted or a full-set, which we recommend every 5 years. Can anyone use the golf simulator? Yes, anyone can use our golf simulator. Whether you’re a beginner who wants a couple of practise hits on the electric green, or a pro who wants digital insights into their swing, our state-of-the-art golf simulator in Brisbane offers hours of fun at the touch of a button. Book your next game of golf. Other golf services we offer. One-on-one coaching with a PGA professional who’s dedicated to improving your swing. Tailored fitting to find the right clubs to suit what you need. A great day on the greens with the people behind your organisation. I’ve been playing here for ten years and love the course. It’s a great challenging layout. It’s a real pleasure to visit and play this course, every day if I could. Hats off to the green keepers, the course is looking spectacular! Any golfer loves the gift of golf. Purchase a gift voucher online and the happy recipient can upgrade their golf gear, or enjoy a great experience with one of our PGA Professionals.